And before you know it, it is time to wrap up the 35th edition of Novel Food, the literary/culinary event that Lisa of Champaign Taste and I created in 2007. Novel Food is about literary works (prose or poetry) that inspire the preparation of dishes. I continue to host this event with great pleasure, as it brings together two of my passions: literature and food. Every edition delivers a great reading list and a lovely set of recipes, and this one is no exception. Claudia particularly appreciates novels with a competent female protagonist and this is one such (mystery) novel, featuring "Jacobia (Jake) Tiptree, recently retired from the stressful field of financial management in New York, and currently restoring a rambling old fixer-upper on an island in Maine." 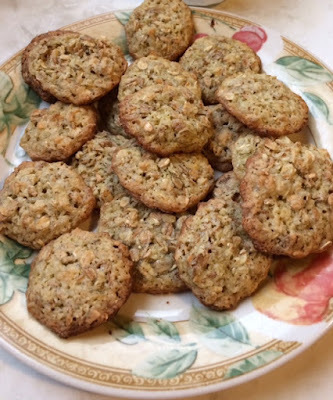 Jake's baking a batch of oatmeal-lace cookies 'a summer delicacy to be enjoyed with iced tea' inspired Claudia, who served them with coffee and an assortment of teas. "They didn't turn out all that lacy, but good just the same." "Maggie [Hope] is an interrupted, genius level mathematician (having left her studies to help in the War effort), an expert code breaker, and trained special agent with Churchill's SOE espionage unit. I loved how she foils an after hours attack. It does not turn out well for the mugger. In this novel a case of political sabotage through lies and murder is foiled with the help of our heroine." 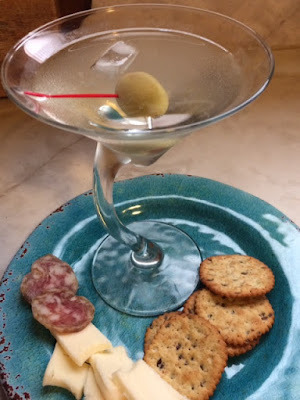 In an earlier novel of the series, MacNeal provided Roosevelt's martini recipe at the end of the book and Claudia followed it and shared it with us. "At Philadelphia’s Saté Kampar restaurant's dinner based on the popular book and film, communal eating is key to the experience and is kicked off by the dumpling making. Owner/chef Angelina Branca created the dinners to showcase the foods and flavors of her Malaysian homeland as depicted in the book... For the dumplings, Chef Branca brought to our table wrappers, filling made with pork, mushrooms and chives and a bowl of water. She proceeded to demonstrate the proper technique of crimping the edges to seal in the ingredients... The results? Imperfect yes, but totally delicious." "The story had me smiling and tearing up in almost equal parts... There was a lot of food in Where the Forest Meets the Stars, much of it cooked over the fire pit at the cabin... decided on Cauliflower in Cheese Sauce because Gabe brings it over for a dinner with Ursa and Joe and I liked their exchange... 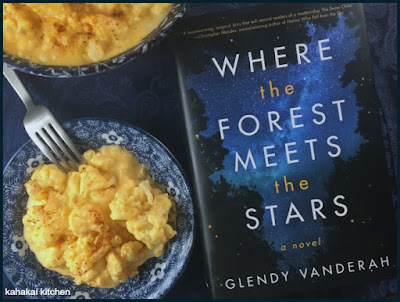 Between Ursa's yuckyflower comments and the fact that my friend was talking about a keto-friendy cheese sauce she made that was giving me serious cheese sauce cravings, I picked it as my book-inspired dish. I like cauliflower already, but enough gooey cheese sauce (and I put plenty of the sauce recipe below on my steamed cauliflower) would make it palatable for a child or anyone who found it yucky." "The last third of the book was probably my favorite as Kwan focused on Rachel and Astrid... Although I was intrigued by some of the characters (mainly Astrid), I found the footnotes to be the most hilarious parts of the novel... I am imagining that there will be at least one satay recipe posted for this round and perhaps some authentic Malaysian food. 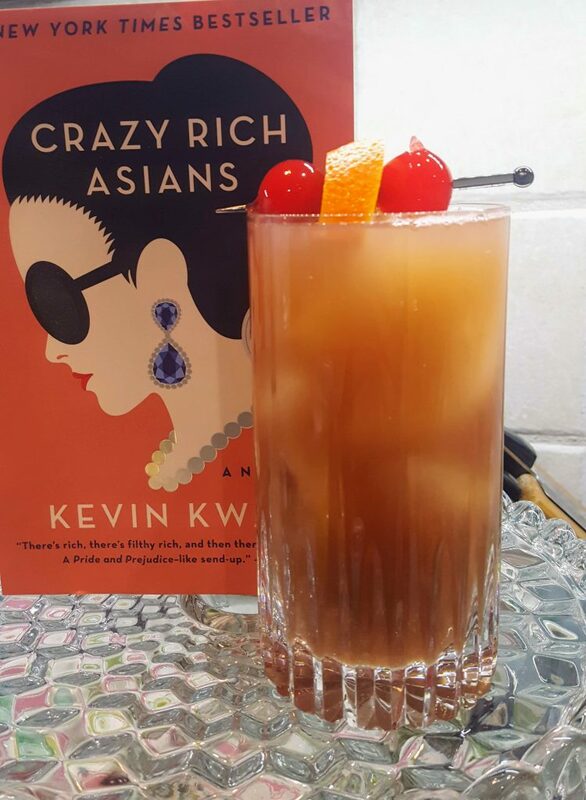 I went the easy route and focused on the final scene of the book—Rachel, Kerry, Nick and Peik Lin enjoying Singapore Slings in the clouds. To repent for my snarkiness above about Nick’s mother, I decided to do something totally different for EE, a mocktail." 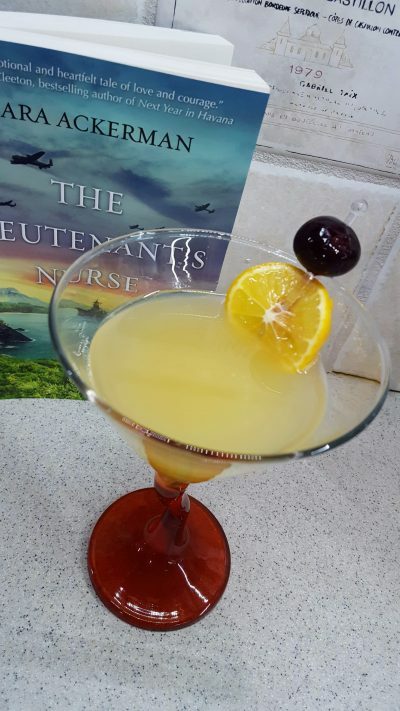 "Set in the vibrant tropical surroundings of the Pacific, The Lieutenant’s Nurse is an evocative, emotional WWII story of love, friendship and the resilient spirit of the heroic nurses of Pearl Harbor... The majority of the novel is about the heroine’s journey to Hawaii... Billy, Eva’s intended, takes her to The Royal Hawaiian upon her arrival in the islands. There, Eva is introduced to this cocktail... I decided to try my hand at the tropical, pineapple kitschy cocktail. The 1950s namesake of one of Hawaii’s most popular resorts, this tropical sipper combines gin, fresh fruit and a splash of orgeat." "The California sunshine’s not quite so bright for three sisters who get dumped in the same week… I did enjoy the ending... I was also glad to see that not all the sisters had to find a man to be happy and fulfilled in the final pages. 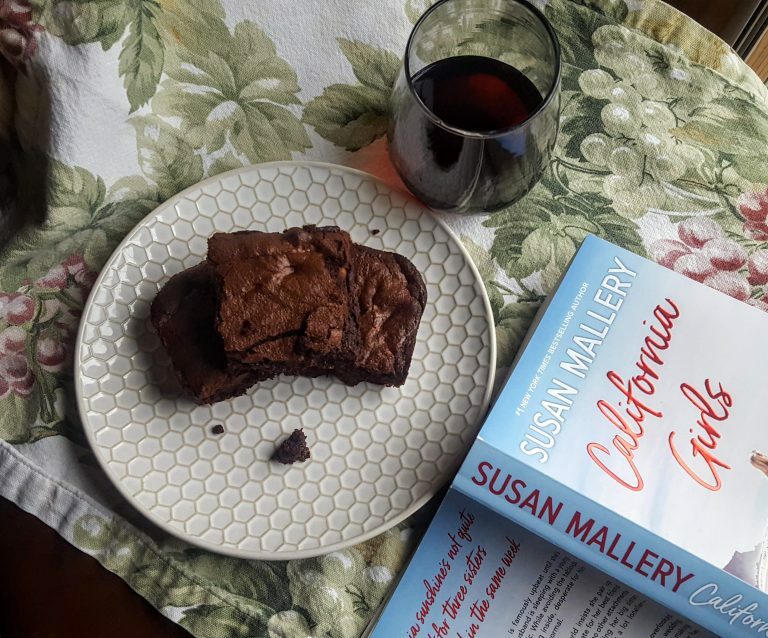 If you’re a romance lover, you will probably adore this novel... At one point, Ali, I believe, is craving (or is actually eating and imbibing) brownies and wine. I immediately thought, 'Well, that’s a novel idea!'... The wine added just a hint of floral overtones. If you like the ooey-gooey variety of brownies, you will love this recipe!" The book "is about a psychotherapist, Theo. His patient, Alicia, is selectively mute. Theo begins a job in a mental hospital where Alicia is housed due to her conviction for the murder of her husband... I decided to go with the walnut cake, though... I made a keto version... And I had a sweet tooth that these cupcakes cured. I had intended to make a Swiss meringue frosting to go on these, but the recipe I tried did not work... So we got unfrosted walnut cupcakes. The texture is much more like a muffin because of the almond flour." The book "details the struggles that the author faced during his life in North Korea and how he was able to escape, though it took leaving his family behind... I had a hard time when I was reading this book about the food. I didn’t want to make light of the lack of food situation in North Korea and I wanted to be respectful of both the story and of the people...The recipe I made for this book is one that was mentioned several times throughout... These are for Ishikawa’s mom who tried to keep up her spirit even in the face of impossible hardship." "The story doesn’t really center on one main character, but it is the story of the Sorenson family... Each character has significant flaws. Each character makes a series of decisions and a series of mistakes and face a series of consequences that shape their lives... Because the story is very much about family, making a family meal for this book seemed appropriate. I went with pork chops mentioned twice in the book. Marilyn is described at one point as 'an exhausted mother of four trying not to burn the pork chops.' This recipe may not be the most beautiful, but it sure is delicious." "The intensity of feelings reminded me of food discussions in Italy: food is at the heart of our identity... In reading about Singaporean dishes with a focus on vegetarian options, I was taken by popiah, fresh spring rolls with jicama, a dish whose preparation brings people together. As the rolls should be assembled and eaten right away, I imagined a group of friends around the table making popiah and eating while debating whose mother had the best recipe... I had to make my own, right?" "The inspiring episode happens early on in the story" when Theo, the protagonist, is shown sitting next to his friend Andy 'eating cocktail shrimp and artichoke canapés from paper plates—or, rather, he ate, while I sat with the plate on my knees, untouched'. "I got 'stuck' on the artichoke canapés... for Theo, I decided to make a spread using fresh artichokes from the farmers' market. The sight of artichokes always reminds me of Italy, where artichokes are popular and prepared in many ways. This spread captures the essence of artichoke's flavor." The next edition of Novel Food will be in early summer: stay tuned for the announcement. In the meantime, read good books (maybe with the next Novel Food in mind), cook good dishes, enjoy good food and otherwise savor life's local and seasonal offerings.